THIS ARTICLE will lay out the basic case for “hereditarianism” or the view that genes are an important cause of racial IQ differences. 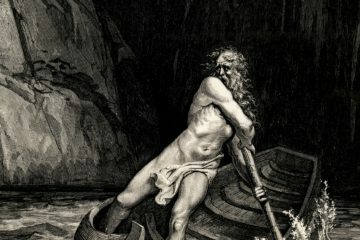 At this point, you may already be thinking something like “no reputable scientist would ever think this!”, “Race doesn’t even exist!”, “IQ tests are culturally biased and don’t measure intelligence anyway!”, “What about poverty, racism, single motherhood, education, etc.,!” all of which will be dealt with in this article. For the time being, just try to keep an open mind. Then, after reviewing the evidence fairly, you can decide whether or not I’m a crack pot. Some people are skeptical of the very ideas of “race” and “IQ”, so let’s deal with that first. Races are just populations that evolved in different environments. Racial groups correspond to genetic clusters and differ enough genetically such that differences in IQ are plausible. 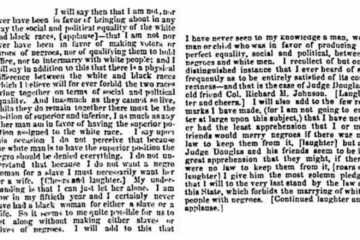 If you really doubt the basic existence of race, see this article dealing with that subject in isolation. Now let’s turn to IQ. The most popular IQ tests include items which test mathematical ability, pattern recognition, short-term memory, verbal comprehension, and vocabulary. They are not perfect measures of intelligence, but they predict how smart a person’s peers say they are as well as how well people do in school and on the job (Denissen et al., 2011; Palhusand and Morgan, 1997; Bailey and Hatch, 1979; Bailey and Mattetal, 1977). In fact, IQ is a better predictor of income and educational attainment than parental socio-economic status is (Strenze, 2006). Now, you might think that other notions of intelligence are important too. Certainly, IQ is not the only important thing about a person and whether to call a given skill “intelligence” is just a fight about words. If you want, you can replace the term “intelligence” with “IQ”. 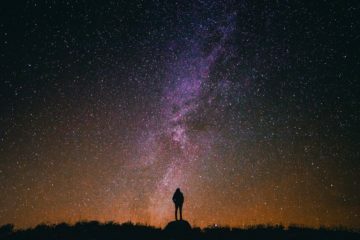 The important point is not that IQ is everything we normally call intelligence, it’s not, but that it is real and important. 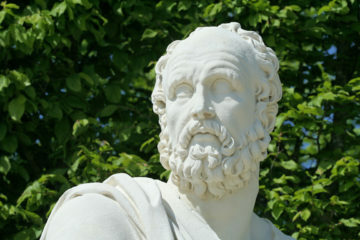 Some people think that IQ tests only measure intelligence among Europeans. This is not true. Surveys of experts show that the vast majority of researchers in this area do not think that IQ tests are substantially culturally biased, and this is for good reason. 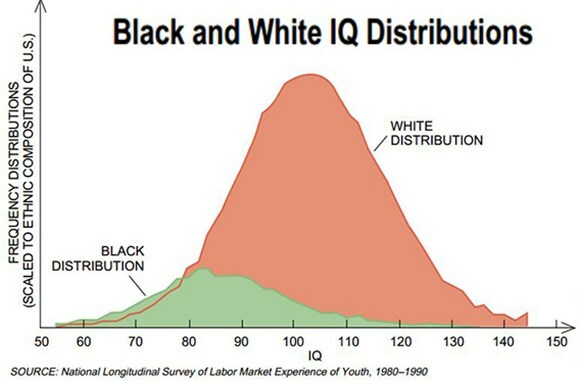 If IQ tests painted non-Whites as being less intelligent than they actually are then they should under-predict how well non-Whites do in school and the work force. They do not (Kobrin, 2001; Cucina et al., 2016; Jensen, 1980). Moreover, if IQ tests are biased, there should be “bias” problems which are among the hardest problems for non-Whites but the easiest for Whites. Actually, Whites and non-Whites rank the difficulty of IQ test items essentially identically (Jensen and McGurk, 1986; Reynolds and Suzuki, 2003). 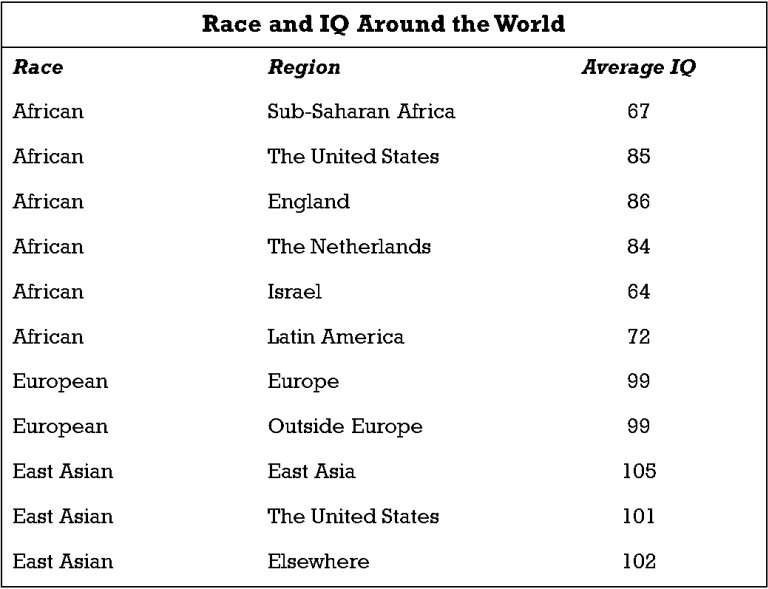 Further still, if IQ tests were really biased against non-Whites, you would expect Europeans to score the highest on them. They don’t, East Asians do (Lynn and Tatu Vanhanen, 2012; Faulk, 2016A). In summary, the idea that IQ tests are culturally or racially biased makes several testable predictions and they have all been falsified. It is uncontroversial that racial differences in IQ exist. Meta-analyses of data on more than 6,000,000 people have shown that Blacks in America score about 15 points lower than Whites do (Roth et al., 2001). East Asians, by contrast, score a few points higher than Whites do. Of course, this does not mean that every African American has a lower IQ than every European American. Actually, these numbers imply that around one in ten African Americans will have an IQ of 100 or higher (the White average) and one in six Whites will have an IQ of 85 or lower (the Black average). The point is that these groups differ on average. That being said, these gaps do matter. If you control for IQ, many social inequalities between the races disappear. For instance, if you hold IQ constant, Blacks are more likely than Whites to get a college degree and get paid the same for the same work. 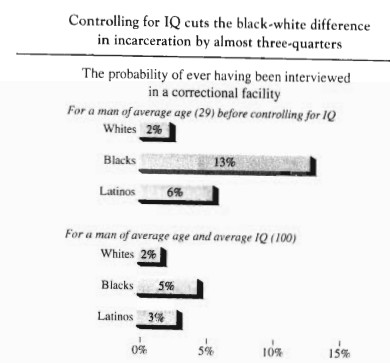 Controlling for IQ also eliminates most of the Black-White Incarceration gap. IQ is also an excellent predictor of national wealth, and changes in national IQ over time predict changes in economic growth (Lynn and Vanhanen, 2012; Pietschnig and Voracek, 2015). At this point, some people may be thinking that the Black-White IQ gap can by explained away by poverty, racism, education, or single motherhood. These explanations have each been refuted. First, let’s look at poverty. Poverty does correlate with IQ, but controlling for socio-economic status, whether measured by parental income, education, neighborhood, wealth, or any other way, does not eliminate the Black-White IQ gap. This has been shown in more than 60 studies over the last 100 years (Last, 2016A). 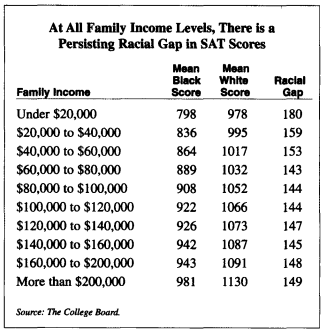 In fact, poor Whites do better on standardized tests than rich Blacks do. The same is true of single motherhood. Even when just looking at people from two parent homes, the Black-White IQ gap persists (Prifitera et al., 2005, table 1.4; Weiss et al., 2016, table 5.6). Moreover, research has shown that the Black-White IQ gap, and the White-East Asian IQ gap, still exists even when only looking at people raised (via adoption) in White homes (Faulk, 2016A). Another possibility is that differences in access to education cause the Black-White IQ gap. This is not possible because the Black-White IQ gap exists by age 3 which is prior to the beginning of formal education (Malloy, 2013). 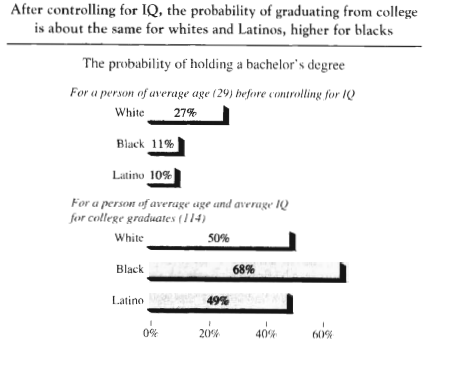 Moreover, the Black-White IQ gap remains after controlling for parental education (Prifitera et al., 2005, table 1.4; Weiss et al., 2016, table 5.6). Further still, Blacks with graduate degrees score worse than Whites without even a four-year degree on tests of cognitive ability (Faulk and Last, 2016). Clearly then, education is not the cause of racial cognitive differences. Finally, let’s look at racism. 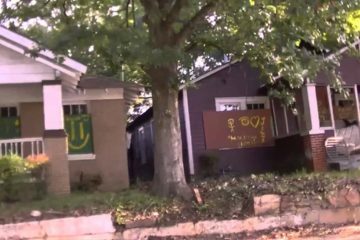 To affect intelligence, racism must impact Blacks through some concrete mechanism. As we’ve seen, racism making Blacks poorer, less educated, or more likely to be from single-parent homes cannot explain the IQ gap. Another possibility is that racism has caused Blacks to internalize negative stereotypes about their intellect which in turn impacts their performance on tests. This hypothesis is refuted by the fact that Blacks score higher than Whites on measures of general self-esteem and are more likely than Whites to describe themselves as being smarter than average (Twenge and Crocker, 2002). Beyond this, there is no obvious way that racism could lower the intelligence of Blacks. Moreover, the Black-White IQ gap is found all over the world, including in Black countries, and did not fall in America between 1920 and 1970 even though there was a huge decline in racism during this time (Last, 2016B). To be fair, some of these potential causes, such as poverty, may contribute a few points to the Black-White IQ gap. However, they cannot account for even half of the difference, let alone all of it. 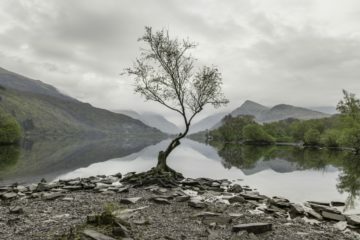 Obviously, these environmental explanations failing does not mean that a genetic explanation will succeed. So, why think genes have anything to do with racial intelligence differences, or, for that matter, intelligence in general? We know that genes impact intelligence through studies of identical twins raised apart and non-biological relatives raised together. Such studies show that the heritability of IQ rises with age and is well over 50% by adulthood (Last, 2016C). This is backed up by studies showing that genetic similarity between individuals predicts how similar their IQ scores will be and by recent studies showing that genetic tests can predict standardized test performance (Last, 2016C, Selzam et al., 2016). This research also shows that non-biological relatives raised in the same home are no more similar than average in terms of IQ despite a far more similar than average experience in home environment. This suggests that differences in home environment explain little to no variation in intelligence in adults. Before going any further, you should know that hereditarianism isn’t a fringe theory. 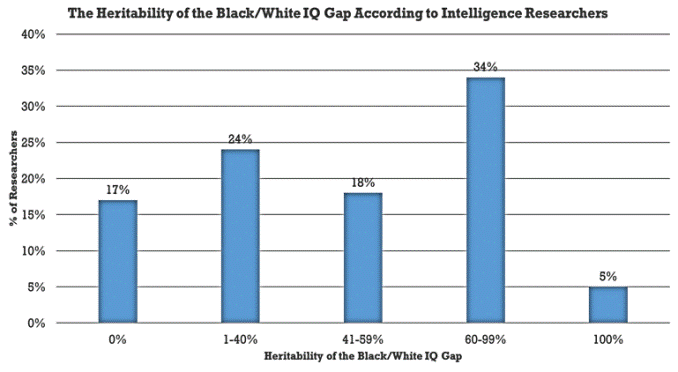 Surveys show that most intelligence researchers take the hereditarian view on the Black-White IQ gap. Recent advances in genetics are consistent with this viewpoint. For instance, Piffer (2015) looked at racial differences in 9 IQ related gene variants and found that Whites were more likely than Blacks to have the high IQ related variants of all 9 genes. 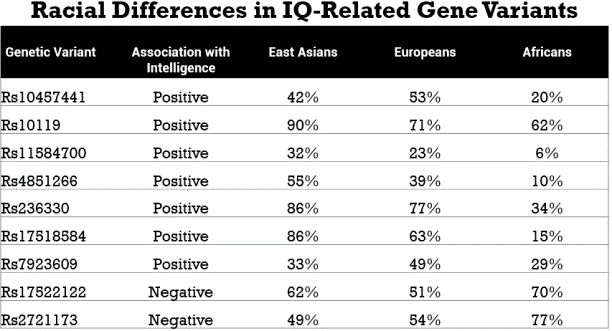 East Asians were also more likely than Whites to have the high IQ related gene variant in the majority of cases. Becker and Rindermann (2016) provided further direct genetic evidence when they analyzed data on 101 countries and found that the more genetically different two populations were the larger the IQ difference between them tended to be. Indirect evidence also points to a genetic explanation. Consider the fact scores on IQ test questions vary in their heritability. Some cognitive abilities are more heritable than others and it turns out that the more heritable a cognitive ability is the larger the racial gap in that ability tends to be (Jensen, 1973; Nichols 1970; Last, 2016D). This finding is easy to explain on the hereditarian view but very hard to explain otherwise. Research has also shown repeatedly that mixed race individuals have IQ scores in between the mean scores of the races of their parents (Faulk, 2016B; Faulk 2016C). One study even found that this was true of mixed race Blacks who incorrectly believed they were fully Black (Weinberg et al., 1992). Once again, this is exactly what the hereditarian viewpoint would predict. Furthermore, Blacks have smaller brains than Whites, who have smaller brains than East Asians (Last, 2016E). Contrary to what you may have heard, brain size does predict a person’s IQ score. Moreover, changes in brain size over time predict changes in IQ, and the same genes which influence IQ are known to influence brain size. A plausible explanation for this data is that variation in brain size causes variation in IQ. More on this can be read about here. There are several reasons to think that racial differences in brain size have a genetic cause. First, the races differ in brain size even at birth (Schultz, 1922; Rushton, 1997; Ho et al., 1980). Research also shows that the races differ in dozens of traits which tend to co-evolve with brain size in a way that is consistent with the brain size differences (Rushton and Rushton, 2003). (For instance, women need larger hips to give birth to larger brained children.) Furthermore, several studies have shown that mulattoes have an average brain size in between that of Blacks and Whites (Pearl, 1934; Bean, 1906). Finally, the Black-White brain size gap did not shrink in the 100 year period between 1880 and 1980 even though the Blacks and Whites converged in every conceivable measure of social inequality (Last, 2016E). Given all this, there is reason to think that genetically caused racial brain size differences play a role in racial intelligence differences. Finally, the racial gap “looks” genetic based on how it changes over time, age, and geography. First, the Black-White-Asian IQ gap is seen all over the world. 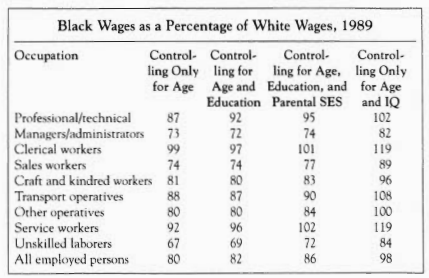 As mentioned earlier, the Black-White gap is also known to be present at age 3, and the Black-White IQ gap did not converge at all between 1920 and 1970 even though the social inequality between the races declined markedly between 1920 and 1970. 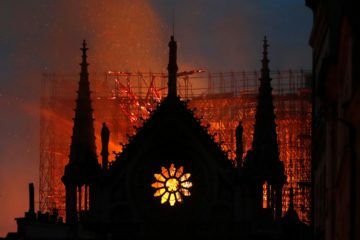 This basic pattern of data is what we would expect if the underlying cause of the gap was genetic and makes explanations which appeal to environmental variables which impact people later in life, or are particular to a specific set of countries, unlikely. In summary, there are many lines of evidence which converge on racial intelligence differences having a partially genetic cause. This doesn’t mean they are entirely caused by genes. They aren’t. But it does mean that genes are an important factor which we should not ignore. To drive home the point that I am not proposing purely genetic explanation of racial intelligence differences, I’m going to briefly mention two environmental factors which I do think are involved. This isn’t an exhaustive list, but it shows that I really don’t think racial IQ gaps are 100% heritable. 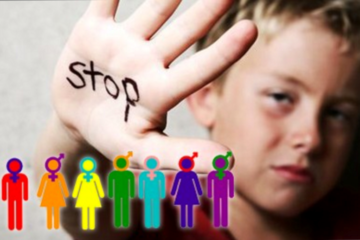 Child abuse has been shown to negatively impact IQ and, unfortunately, child abuse is more common among African Americans than it is among Whites. This accounts for a small proportion of the Black-White IQ gap in America. I’ve written about this in more detail here. There is also good evidence that breastfeeding raises IQ and African Americans are less likely than White Americans to breastfeed. This too likely contributes to the Black-White IQ gap in America. Of course, none of this negates, or is mutually exclusive with, the positive evidence for a partially genetic cause. Rather, the take away is that a complex mix of genes and the environment account for racial intelligence differences. Given the strength of the genetic evidence and the high heritability of IQ in the general population, I am inclined to think that racial intelligence differences are at least 50% heritable if not more so, but that still leaves room for plenty of other causes. 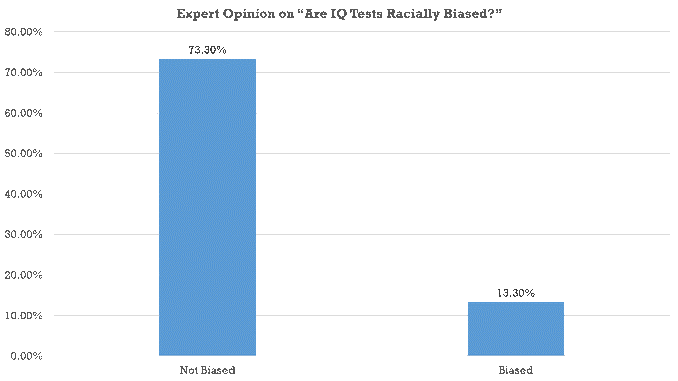 This article is meant as an introduction to the hereditarian case on race and IQ. 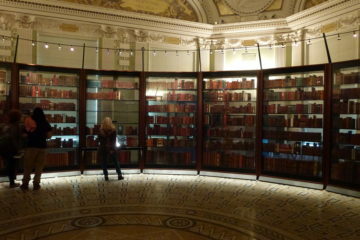 A more comprehensive set of articles can be found here for those who require further evidence. If the case presented here was compelling to you, here is what I consider to be the key take away: racial inequalities are probably a permanent feature of society that we’ll have to learn to deal with and they aren’t anybody’s fault. If society can internalize that truth, we’ll have made real progress towards understanding ourselves as a species. the TAKE AWAY is that the U.S. – Europe – Australia – South Africa & Canada are white countries. All others Get Out. “Multiculturism”, “Diversity” results in miscegenation and miscegenation is Genocide for the white race. Those who don’t support “white sparatism” are guilty of genocide. Who could disagree with the following? Only parasites and leeches, who can not create for themselves, who can not create their own civilization, but can only steal from their betters, the white race, only parasites and leeches who demand the freedom to go on living off the efforts of the white race. We are not pacifists, for we know that the father of all things is combat and struggle. We see that race is of supreme importance to the life of our nation as well as character, the basis of which must be responsibility toward our People. We are absolutely convinced that every decision requires responsibility. 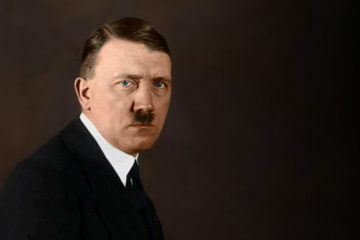 That is why we are at odds with the entire world, that is why we are considered subversive and why we are prohibited from speaking, and why we are silenced, because we want to restore the health of our entire German nation and to cure it from this cursed sickness of fragmentation. 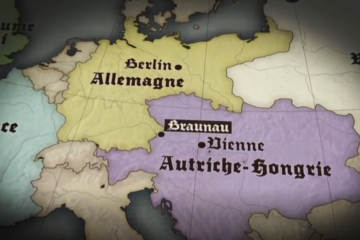 However, the greatest revolution Germany has undergone was that of the purification of the Volk and thus of the races which was launched systematically in this country for the first time ever. The consequences of this German racial policy will be more significant for the future of our Volk than the effects of all the other laws together. 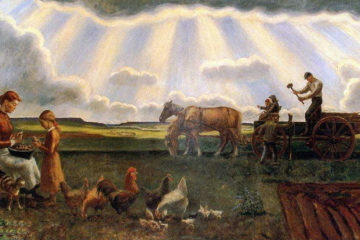 For they are what is creating the new man. 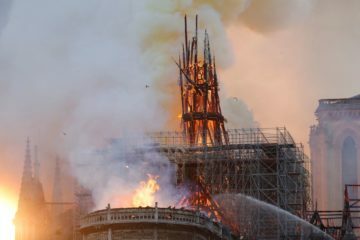 They will preserve our Volk from doing as so many historically tragic past prototypes of other races have done: lose their earthly existence forever because of their ignorance as regards a single question. For what is the sense of all our work and all our efforts if they do not serve the pupose of preserving the German being? And what good is any effort on behalf of this being if we omit the most important thing to preserve it pure and unadulterated in its blood? Any other mistake can be rectified, any other error can be corrected, but what one fails to do in this area can often never again be amended. Whether our work in this area of purifying our race and thus our Volk has been fruitful is something you can best judge for yourselves here during these few days. For what you are encountering in this city is the German being. 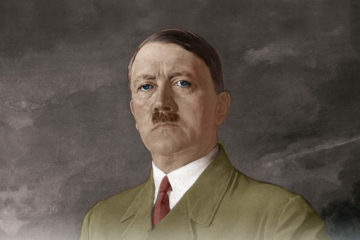 Come and see for yourselves whether he has become worse under National Socialist leadership or whether he has not indeed become better. Do not gauge only the increasing number of children being born-gauge above all the appearance of our youth. 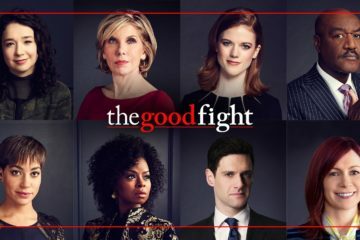 How lovely are our girls and our boys, how bright is their gaze, how healthy and fresh their posture, how splendid are the bodies of the hundreds of thousands and millions who have been trained and cared for by our organizations! Where are there better men to be found today than those who can be seen here? It is truly the rebirth of a nation, brought about by the deliberate breeding of a new being (bewusste Zuchtung eines neuen Menschen). how come most invention and pretty much all endeavours in civilisation were by Caucasians and not east asians then! I don’t trust mr. lynn on this! Even if the average Asian IQ is higher, the European IQ curve is flatter, meaning there are proportionally more people on the extremes than the average. Therefore we have just as many geniuses, possibly more geniuses, as them per unit of population. 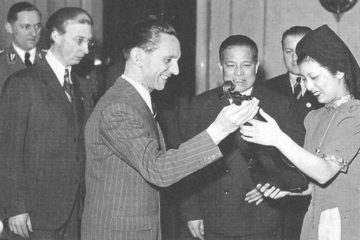 There is also something qualitatively different about European intelligence: Our greatest minds seem more creative, and also more willing to say to entrenched establishments and to the world: “I have figured this out. I am right and all of you — every single one of you — are wrong, and I will prove it.” I highly recommend you read Charles Murray’s Human Accomplishment for a rigorously-researched factual overview.